Hey there! I'm back today for the final day of the December Papertrey Ink coundown. Everything you've seen peeks of will be available tomorrow! 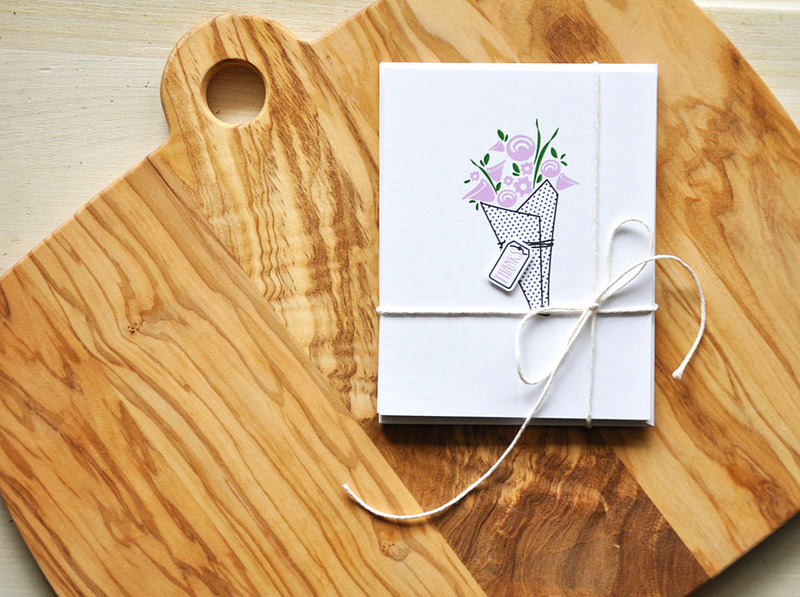 I'm at it one last time to bring you a final Fresh Floral Wrap-Ups sample. Today's card is all about showcasing the interchangeable sentiment. 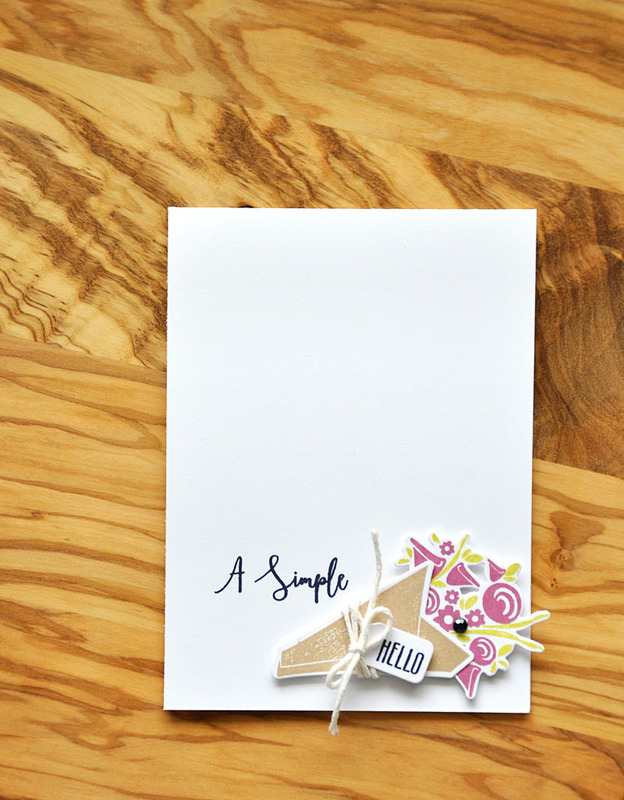 When paired with the tiny tag these phrases can be made: A Simple... Hello, Bonjour, xoxo, and Thanks. A nice pop of color (kraft, limeade ice, autumn rose) and a touch of twine really bring this simple card to life. Well, that concludes my last look at Fresh Floral Wrap-Ups for you. Just remember... this stamp set and it's coordinating dies will be available for purchase through Papertrey Ink, beginning December 15th. Hi folks! Welcome to day four of the December Papertrey Ink countdown. Here's a one layer card that puts Fresh Floral Wrap-Ups to great use! This triple bouquet design really makes a big impact for such a simple card. The colors I've chosen to work with... kraft, limeade ice, raspberry fizz, berry sorbet, and summer sunrise. Well, there's a quick look at Fresh Floral Wrap-Ups for you. Just remember... this stamp set and it's coordinating dies will be available for purchase through Papertrey Ink, beginning December 15th. Hi! Welcome to day three of the December Papertrey Ink countdown. 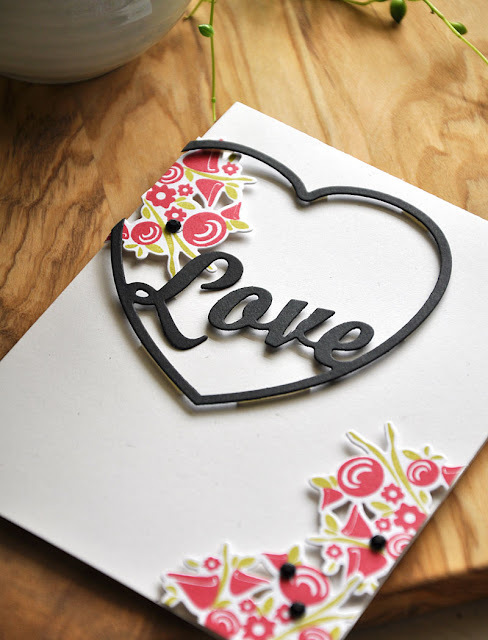 For today's look at Fresh Floral Wrap-Ups I'm focusing on a valentine/love theme. 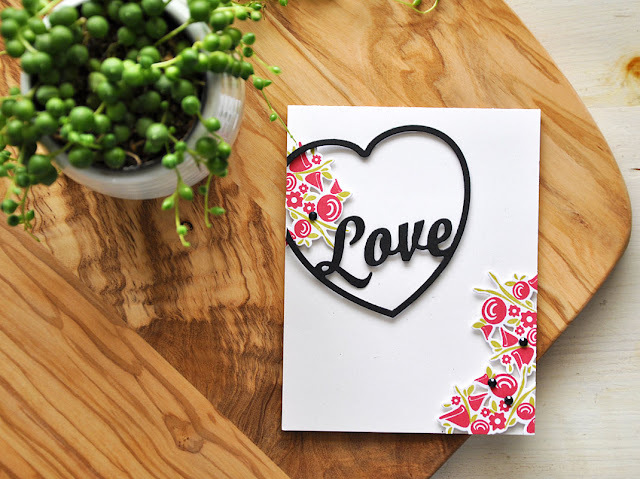 For an out of box take on this stamp set I've paired the bouquet top with the Enclosed: Heart die. I aligned the bouquets along the outer edges and then trimmed off the excess. Hello and welcome to day two of the December Papertrey Ink countdown. 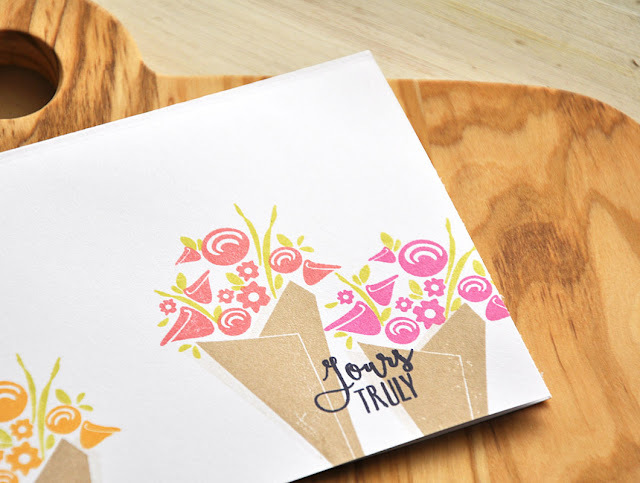 Today I bring you another quick look at the Fresh Floral Wrap-Ups stamp set and dies. This time around I assembled a pretty card trio. These are simple to make and perfect for gift giving. Three smokey shadow stamped wraps (with twine) are topped with either a melon berry/new leaf, lavender moon/new leaf, or scarlet jewel/new leaf bouquet color combo. 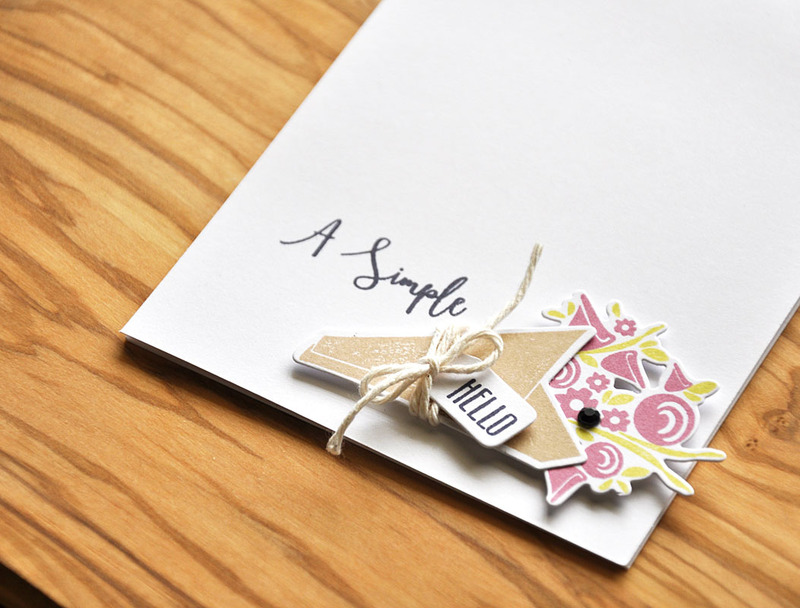 A custom matching tag was cut using the coordinating dies, then attached with a bit of dimensional adhesive to give these simple cards a little pop. 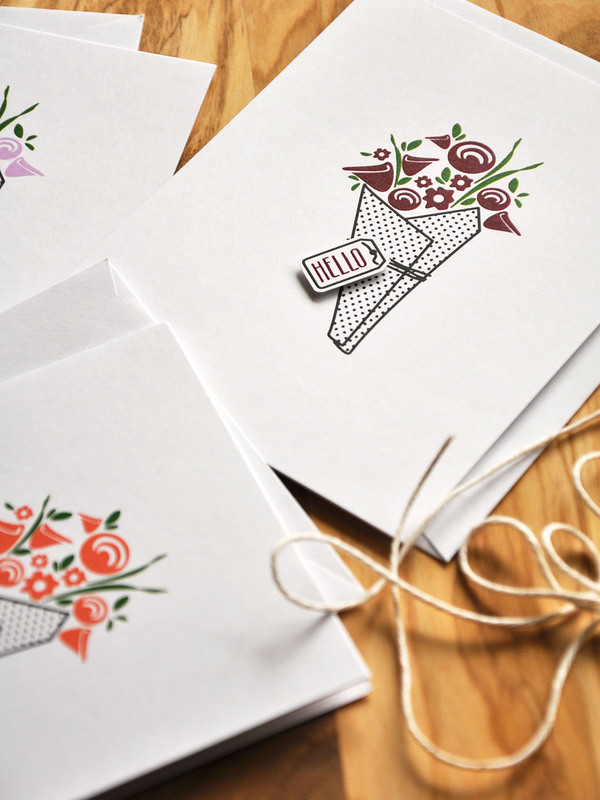 Well, that concludes another quick look at Fresh Floral Wrap-Ups. Just remember... this stamp set and it's coordinating dies will be available for purchase through Papertrey Ink, beginning December 15th. 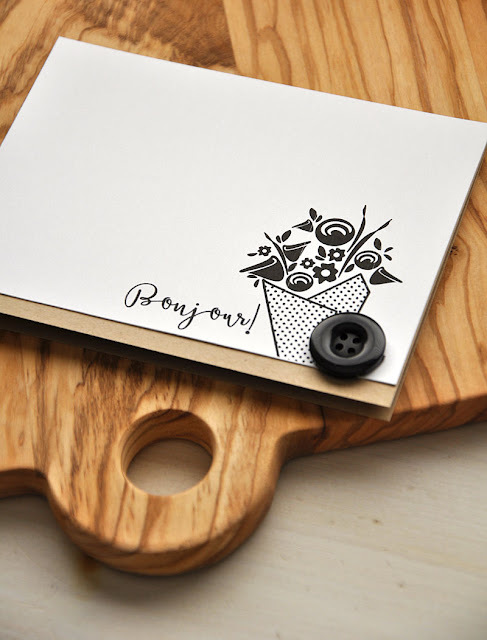 Now, be sure to visit Papertrey Ink blog for more details on this set as well as today's other featured new product. Heather Nichols is also working her magic with this set. Don't miss it! 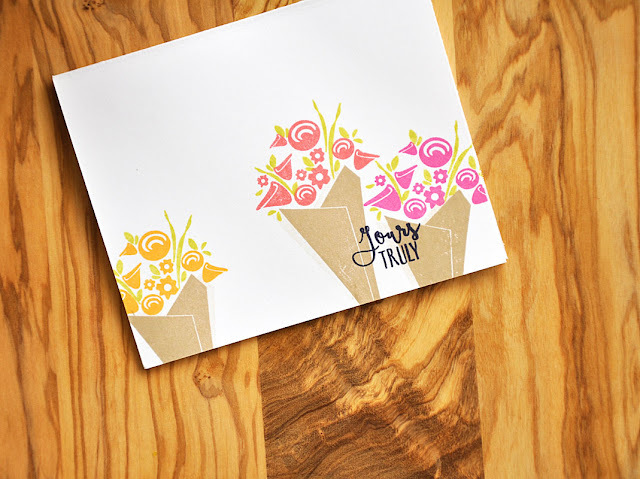 For this months release I bring you another addition to my Stamping Simply lineup... Fresh Floral Wrap-Ups stamp set and dies! 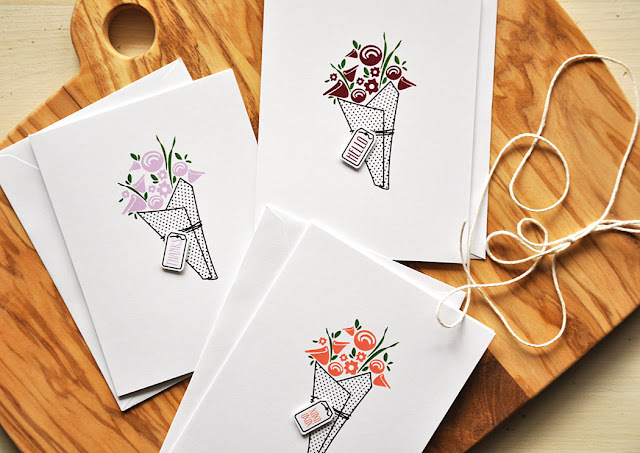 Now you can start adding sweet little bouquets to your projects that look like they are fresh from the florist shoppe. 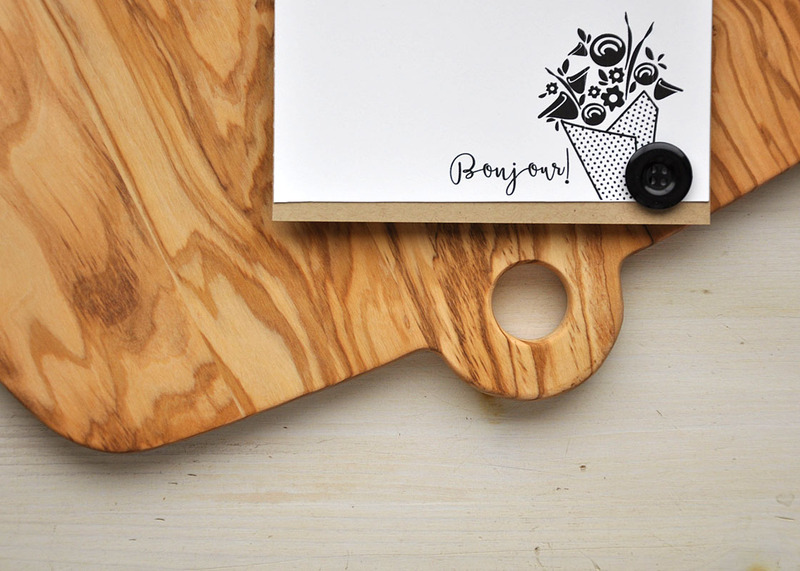 Add a touch of twine and a customizable tag. You'll be amazed by all you can do with these wrapped bundles! 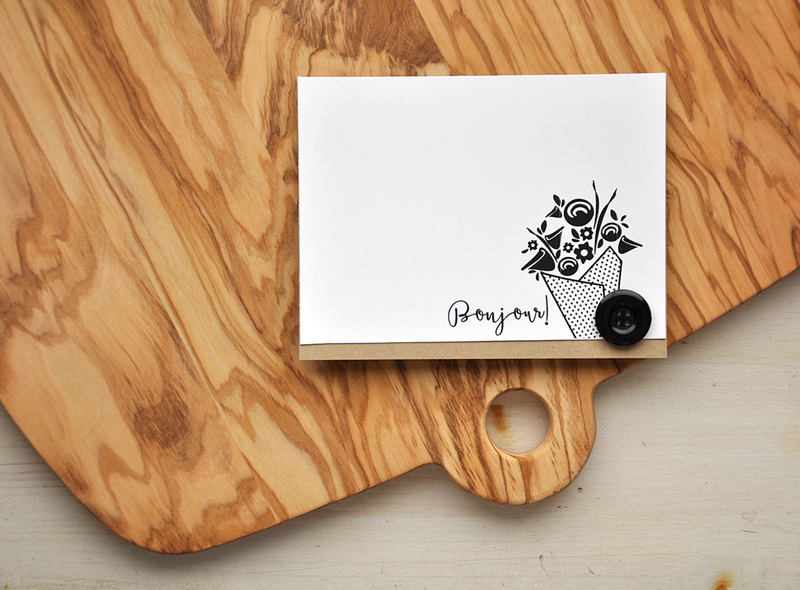 I've stamped a polka dot wrap, flowers, and leaves in black ink to create a simple black & white focal point. Then mounted the stamped panel onto a kraft card base. And embellished with a black button. A simple yet effective embellishment.